St. Clair Hospital’s Ultrasound Obstetrics/Gynecology suite features one of the most sophisticated ultrasound systems in the region. Ultrasound uses high-frequency sound waves to produce moving images of the body’s internal soft tissue structures. It is a safe, fast and painless means of diagnostic imaging. This dedicated service, which includes extended obstetrical ultrasound examinations, is located on the Second Floor of the Hospital, in Suite 212, and is designed to provide more comprehensive services for patients in a convenient setting. 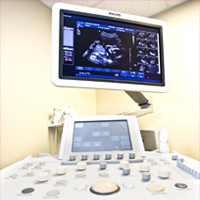 The service is administered by ultrasound technologists with extensive experience specializing in OB/GYN ultrasound and who are registered by the American Registry of Diagnostic Medical Sonographers in OB/GYN. All of the radiologists who interpret the ultrasound studies are accredited by the American College of Radiology. The suite uses an iU22 ultrasound system from Philips Medical Systems, which features 4D (or real-time 3D) imaging technology that allows clinicians and patients to view the fetus and internal organs in 3D. Results from ultrasound exams often reduce the need for more invasive procedures. The OB/GYN ultrasound suite is open 7:45 a.m. to 4 p.m. Mondays through Fridays. Same day appointments are available. For more information, please call 412.942.3260. On average, 1,400 babies are born each year at St. Clair Hospital. Click here to learn more about our Family Birth Center.